Nia is immersed in her melancholy in the rain. Nia's sister has killed herself and left a big hole in the family structure, making it difficult for Nia to cope. Nia dreams of becoming a nurse in the 'big smoke' of Perth. Nia's Melancholy shows her falling asleep in the forest where she wakes up crying, finding her own sadness about the loss. Here is an interesting behind-the-scenes story from the Nia's Melancholy site. 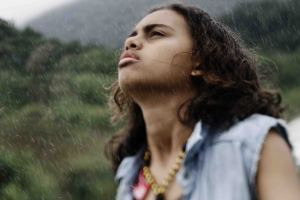 "It was important for the writer/director and the Kuku Yalanji Community at Mossman Gorge, where we shot the film, to be welcomed to their country in a smoking ceremony that would also keep away any bad spirits and accidents to all of our cast and crew. "This ceremony took place the day before filming began and it was a very spiritual experience for everybody as most of our crew were from urban parts of Australia or overseas. The comforting words of the Elders protected us effectively during the whole week of production, as no accident or major delays were experienced and we enjoyed perfect weather conditions. "However, the day after we wrapped and left Mossman, the area was flooded with torrential rain that would have kept us from filming." Nia's Melancholy is based on a real story. Sio F. Tusafa'aaefili is a filmmaker of Torres Strait Island and Samoan descent.